Intramembrane proteolysis – the cleavage of peptide bonds in the hydrophobic environment of cellular membranes – is only known since the 1990s. Since then, intramembrane proteases have been identified in all kingdoms of life. Most substrates are integral membrane proteins with a single transmembrane (TM) domain harboring the scissile peptide bond (recently, also proteolysis of polytopic membrane proteins and trimming of lipidated peripheral membrane proteins has been described). The diversity of functional roles of these unusual proteases includes activation of membrane-tethered transcription factors and transcriptional activators, secretion of growth factors, maturation of a bacterial translocation channel, and regulated protein degradation. Also, the malfunction of these enzymes can lead to Alzheimer’s disease, frontotemporal lobe degeneration, Parkinson’s disease, type-2 diabetes, and glaucoma. Intramembrane proteases are distinguished by their transmembrane topologies and by the nature of their membrane-embedded active site residues (Fig. 1): Aspartate intramembrane proteases with a characteristic GxGD consensus sequence are represented by presenilin, the catalytic subunit of γ-secretase, and by signal peptide peptidase (SPP) and its homologues, the SPP-like (SPPL) proteases (SPPL2a, SPPL2b, SPPL2c and SPPL3). Serine-intramembrane proteases comprise a characteristic Ser-His catalytic dyad and are also known as rhomboid proteases. The Site-2-Protease (S2P) is the only known member of the metallo-intramembrane proteases. Very recently, the glutamate-intramembrane protease Rce1 has been added as a fourth class of intramembrane proteases. Fig. 1: Transmembrane topologies of intramembrane proteases of the GxGD and rhomboid families – that this research team is focussing on - and their substrates. Upper case letters within TM domains represent catalytic residues and scissors symbolize cleavage sites (Langosch et al., 2015). Presenilin has an Nin topology and is associated in a 1:1:1:1 stoichiometry with three invariant subunits forming the γ-secretase complex: Nicastrin, PEN-2, and APH-1. SPP/SPPL proteases, exhibit an inverted (Nout) membrane topology relative to presenilin and do not need invariant co-factors for their activity. Rhomboids are defined by a six-TM domain core, which is often extended by an additional TM domain and cytosolic domains. Secretory pathway rhomboids expose their active sites towards the extracellular side or the lumen of an organelle and high-resolution structures without substrate have been solved. The mitochondrial rhomboid PARL has an inverted topology where an extra TM domain is appended to the N-terminus and where the active side faces the mitochondrial matrix. Most intramembrane proteases process multiple substrates. For example, about 90 substrates are known for γ-secretase and all of them share a single-span Nout transmembrane topology (Figs. 1 and 2). In general, γ-secretase substrates require shedding of their extracellular domains prior to intramembrane cleavage (a dogma that is currently being challenged, see Aim 1!). For example, shedding of the amyloid precursor protein (APP) by γ-secretase yields its C99 fragment, whose TM domain is cleaved by γ-secretase. In contrast to that, SPP/SPPL substrates have an Nin topology, which mirrors the inverted topology of these enzymes. Only some of them require shedding. Most substrates of bacterial and secretory pathway rhomboids are Nout. Inversion of rhomboid topology, as in PARL, is paralleled by an inverted substrate topology. Shedding is not required for rhomboid action. What do we know about the molecular properties that prime substrate TM domains for proteolysis? An initial step requires substrate/enzyme interaction, most likely achieved via mutual interaction between TM domains (Fig. 3). 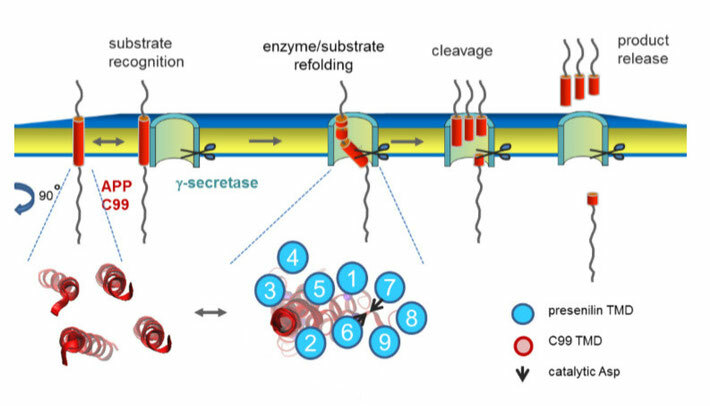 Since the active site of an intramembrane protease resides within a bundle of TM domains, it is likely that processing of a bound substrate requires that a cleavage site gains access to the catalytic cleft. This can be achieved either by translocating it entirely into the enzyme or by changing its conformation while it remains bound to the exosite, an (initial) substrate binding site distinct from the active site. The ensuing cleavage reaction is followed by release of the reaction products. Most information is currently available for γ-secretase substrates. Cleavage is believed to be initiated at alternative sites, termed E48 and E49, in C99, the best studied case. This leads to release of the most abundant Aβ40 and the minor Aβ42 and Aβ38 peptides plus minor species. Fig. 2. Molecular features of known intramembrane protease substrates. SPP/SPPLβb enzymes also cleave at multiple sites while rhomboids make single cuts. To date, most insights into substrate sequence requirements stem from the analysis of sitespecific mutants in cleavage assays. Mutating the TM domains can slow down proteolysis and/or change the patterns of cleavage products thus clearly indicating sequence-specific substrate proteolysis. Many mutations appear to change the conformational flexibility of substrate TM helices which is consistent with the known requirement of local TM helix unfolding for the actual cleavage reaction. On the other hand, more recent work challenges the widely held belief that such local TM domain unfolding influences the overall kinetics of proteolysis. Recently, Langosch, Scharnagl and co-workers suggested that global conformational TM helix flexibility, like bending at a C99 diglycine hinge may determine the rate by which a substrate is recognized, presented to the active site, and/or handled during processive proteolysis (Fig. 3). 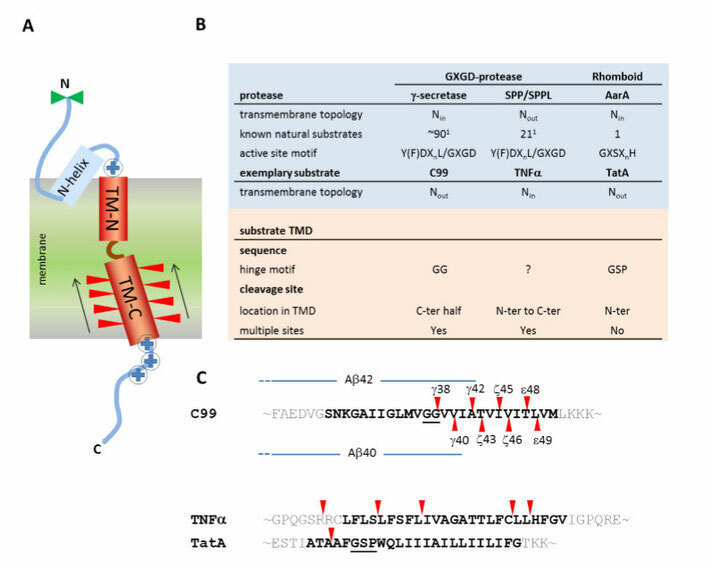 In the case of substrates of bacterial and secretory pathway rhomboids, substrate cleavage sites map at the border of the N-terminal juxtamembrane region and the TM domain. A bound substrate TM domain may either translocate to the active site or remain bound to an exosite while helix-destabilizing residues downstream of the cleavage site may allow helix bending such that the cleavage site can access the enzymatic cleft from the top. In one view, proteolysis by rhomboids depends on substrate recognition by the enzymatic sites. On the other hand, it was proposed to depend on the exposure of the scissile bond to the active site which is influenced by TM domain mutations. The situation might yet be different with the mitochondrial rhomboid protease PARL which cleaves its substrates right in the center of their TM domains. Again, highly conserved TM helix-destabilizing residues promote cleavage of its substrate PINK1 but it is not known how they influence helix dynamics and how this controls proteolysis. Taken together, intramembrane protease substrate TM domains greatly diverge in primary structure, yet they clearly contain important determinants of substrate proteolysis. It is still unclear to which extent substrate proteolysis relates to substrate homomerization, its recognition by the enzyme, and to its translocation to the enzyme’s active site. It will be rewarding to compare substrate properties affecting these steps for different types of intramembrane proteases.